In this tutorial, you will learn about how to create a contact form with captcha verification using PHP / HTML. I assume you have the prior knowledge of HTML and PHP to understand this tutorial. It's a kind of test to know if the response is generated by a human or generated by a software / bot. The user needs to enter the letters from a distorted image in the text box. This text is difficult to read / decode by softwares / bots but can be easily read by humans. Step 1: This requires you to create a PHP file for creating captcha image with text. Create a PHP file Captcha.php and save it in your local folder. Copy and paste the code below in this file. Step 2: This requires you to create a PHP file for creating a contact form. Create a PHP file Captcha_Form.php and save it in your local folder. Copy and paste the code below in this file. 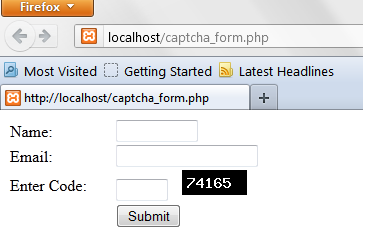 Step 3: This requires you to create a PHP file to verify the cpatcha code with the code in captcha image. Create a PHP file Submit_Form.php and save it in your local folder. Copy and paste the code below in this file. You can test the this form by entering captcha code from the image in the Enter Code text box. If the captcha code matches with the code in captcha image it will display You are Human else it will display You are not Human.